Furthering its endeavor to give a professional edge to everything Bengaluru FC does, the club has roped in the assistance of Dejan Milosevic who is helping out ’keepers Pawan Kumar, Bruno Colaco and Ricardo Cardozo. Australian Milosevic’s twelve years as a professional goalkeeper included a five-season stint at English side Leeds United. “I’ve interacted with the ’keepers at the club and what I see is plenty of potential. They are willing to learn and to do well,” said the 35-year-old who will be helping the young ’keepers out for a fortnight. 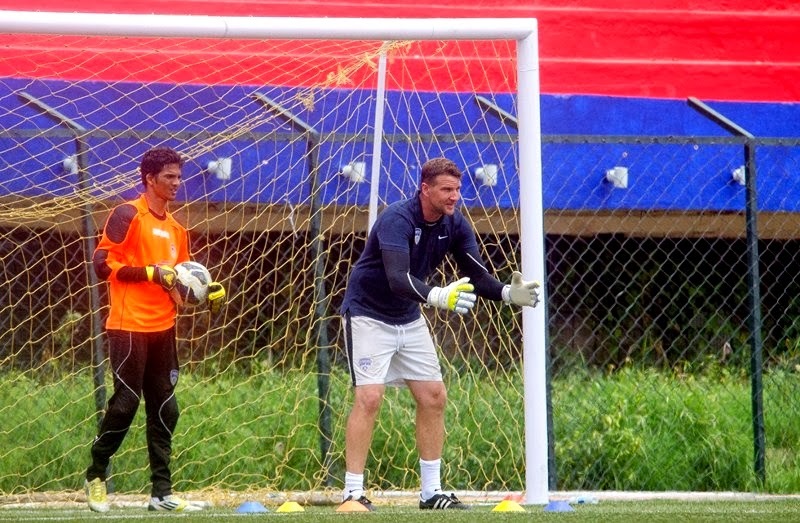 On why he chose to come over to India and lend his expertise, Milosevic says the buzz about the club was a big reason. “It’s a brand new club and the team that Ashley Westwood has built looks exciting. More importantly, this opportunity has given me the chance to test myself as a coach,” said Milosevic. The former Perth Glory ’keeper is also testing his new brand of goalkeeper gloves called XSENTR1Q. “We are coming up with complete goalkeeper solutions and the gloves are a part of it. We are getting the ’keepers to use and are taking feedback as to where we could get better,” he said.